Suzie looking very innocent... don't buy it! Since I haven't achieved one of my life goals of having a sewing room, I have to create a make-shift sewing area in my living room whenever I get the urge to be crafty (this happens often and my roommate Amy is super accommodating). A very behaved cat... so far. I'm working on an "Another Brick in the Wall" quilt from Carolina Patchworks using orange and blue fabrics (Go Gators!). 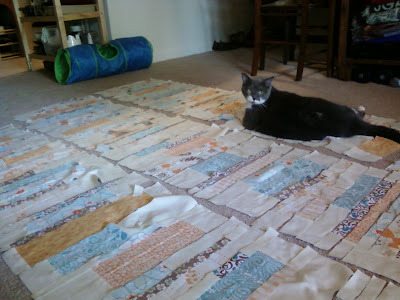 While working on the layout, I placed about a million strips of fabric on the floor and of course the kitties, Suzie (gray and white) and Otis (black), immediately decided to lay on them. Although I carefully chose the order, the kitties had a better idea and decided to "help" by messing up my layout. It is a good thing that the layout was totally random to begin with. They looked very pleased with themselves. I will post updates as the quilt comes together with the help of my two consultants.